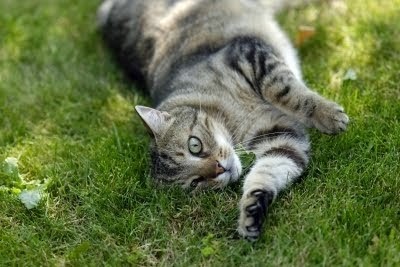 Q: My domestic short hair cat was diagnosed with stomatitis. Her gums are inflamed and she has terrible breath. My veterinarian recommended extracting some of her teeth. This seems drastic and I was wondering if there is a stomatitis treatment I can do using natural remedies to try to help my cat? Conventional veterinary stomatitis treatments are limited and can leave pet owners feeling hopeless. However, holistic treatments for stomatitis can work, especially if started before your cat's disease progresses too rapidly. Early intervention is key to helping your cat feel better. Autoimmune disease is often set off by triggers. The body forms antibodies to is own tissues and attacks itself. Conventional stomatitis treatment (teeth removal) is designed to relieve your cat's pain and discomfort but most likely won't stop the progression of the disease. What holistic care can do is to try to identify the triggers that is the root cause contributing to the stomatitis. While genetics are clearly a factor, anatomy does not have to mean destiny, especially when the stomatitis is discovered early. Immune Harmony-- this formula is designed specifically for autoimmune diseases. It helps to modulate the cat's immune system and is well-tolerated by cats. Colostrum For Pets-very helpful for bad breath, gingivitis and gum diseases. Colostrum contains essential immune supportive ingredients, especially helpful for stomatitis. Quentans and Notatum--These two powerful formulas help to fight infection and inflammation. One autoimmune trigger may be that the cat has an underlying virus so the antiviral support of Quentans is essential in these cases. In addition to adding the supplements, cats with stomatitis require a special diet. Many "premium" brands contain fillers, chemicals, food coloring and even sugar! Cats are carnivores and need a high protein diet, especially when they are fighting off an autoimmune condition such as stomatitis. Certain proteins can be triggers for the autoimmune attacks. Please read this indepth article about autoimmune disease to learn more about foods to avoid. 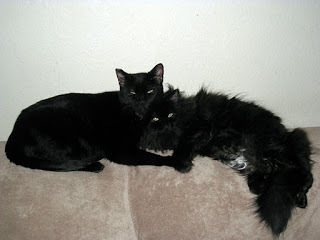 “I adopted my 2 kitties, Max and Sasha, who had been neglected in their previous home. I took them to the vet and found out that Max was suffering from a severe case of stomatitis and Sasha also had a mild case of stomatitis. For almost a year, Max suffered through rounds of antibiotics and steroid shots, trying to calm his symptoms just so he'd be able to eat. Then I found AskAriel, where I read the section about stomatitis. I received a food recommendation from Ask Ariel that I was able to find in my local pet store. I also started daily giving the kitties Power Probiotic for Pets, Colostrom for Pets, Immune Harmony, and Quentans. A year later, the kitties visited the vet and she was thoroughly impressed with Max and Sasha. She said she didn't see anything unusual... no redness, no sores, no buildup on the teeth or anything! I now have two of the happiest kitties on the planet!